Once the first week was over, things went somewhat back to "normal". We transitioned Brody out of our bed and back into his crib. He called often for "momma's bed", but with a few stern corrections, he has since stopped asking. Unfortunately, bedtime is a sad time and tears are shed, unlike before the accident. We learned very quickly that Benedryl was key to a good night's rest for him - we didn't forget after that! During our second week, we went to follow up with the doctor to see how things were going since his cast was put on. Autumn tagged along and we planned to make a day out of it. 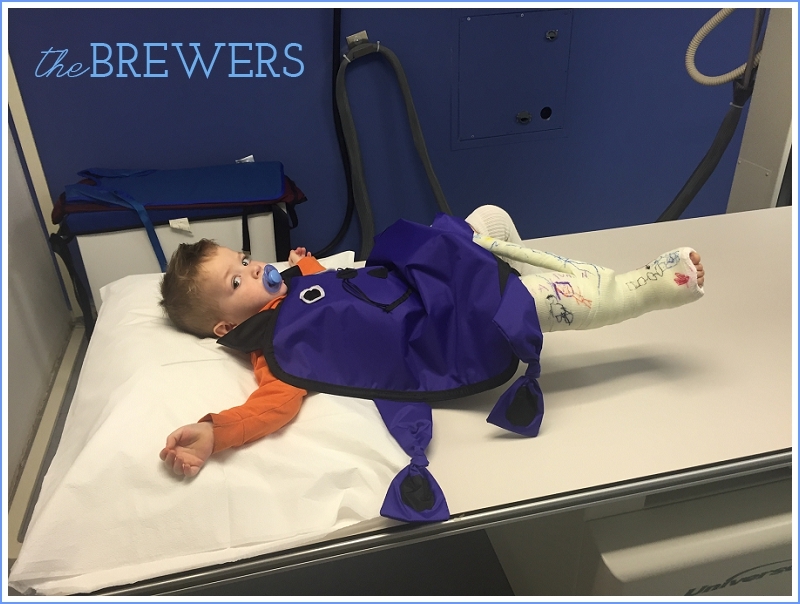 Brody needed a few X-rays to see how things were healing, and as you can see by the look on his face, he wasn't sure of the whole thing... Especially since the last time he was getting X-rayed, he had a broken leg and people grabbing and bending it! The doctor gave us great news - instead of 6 weeks, she thought 4 weeks would be sufficient to heal his break! Wahoo! We wouldn't need anymore visits to the doctor until the 4 weeks were up, so I eagerly made our appointment. There's no guarantee when we go in next that the cast will come off, but hopefully the X-rays will show that our time in a spica cast is over! After our appointment, we headed west to Leesburg to visit my nieces and nephews, and my mom, who was looking after them while their parents were out of town on a work trip/getaway. It was a really fun visit. Especially great for Autumn to get out, as she's had her social life take a bit of a hit with our being so home bound lately. We had dinner with the family and headed home as bedtime rituals were beginning. It was a great afternoon! 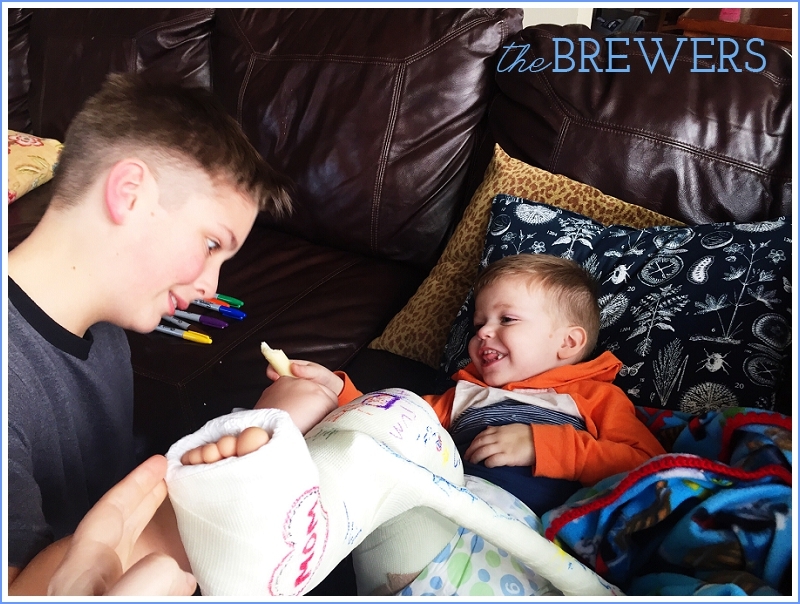 Cousin Jackson adding his John Hancock to Brody's cast. All the cousins took a turn. Eventually, we needed to tackle how to bathe this little dude. The spica cast itself wraps around Brody's waist like a belt, with a little cutout for his privates and bottom. He wears two diapers - one a size smaller than usual, tucked up inside the cast as best we can, and one two sizes larger to cover the "peek a boo" and act as a second layer of protection. No matter how well we tucked, the cast just seemed to absorb urine. That was our biggest issue as the weeks progressed - not so much #2. Salon style seemed to be the best method a google search returned. 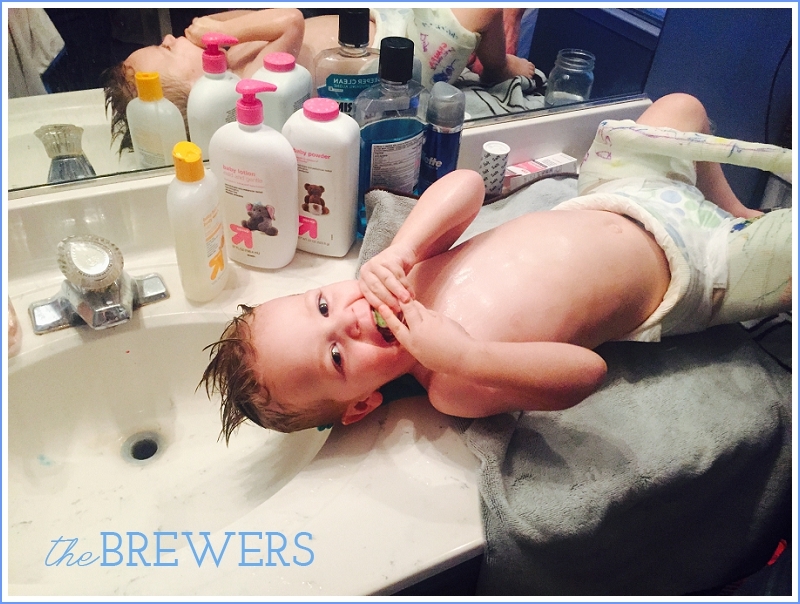 We laid him down on the bathroom counter and used a washcloth to pad his head. 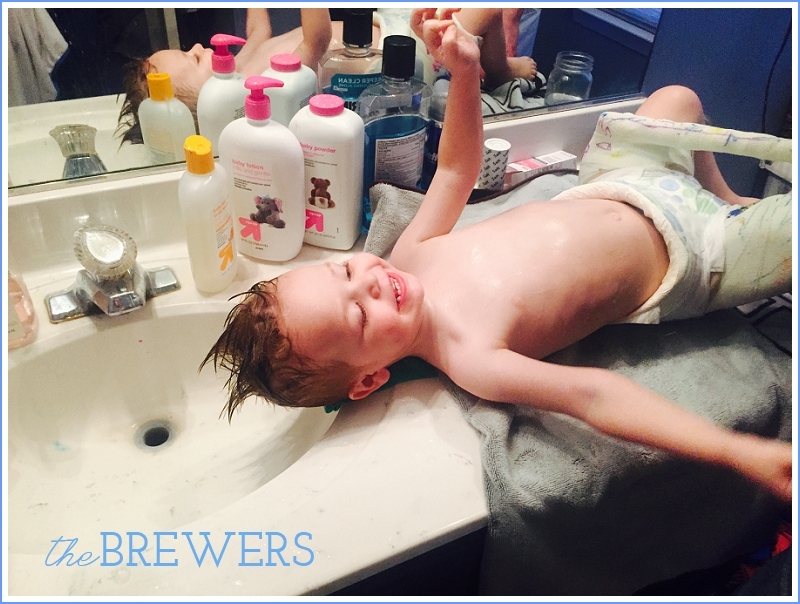 We washed his hair and body, being sure to not get the water close to his cast. Ever since his surgery the left leg (exposed) has a weird texture/film on it. The sponge baths and lotion haven't gotten rid of it, so I am looking forward to and eager for his first, real bath after the cast is removed. 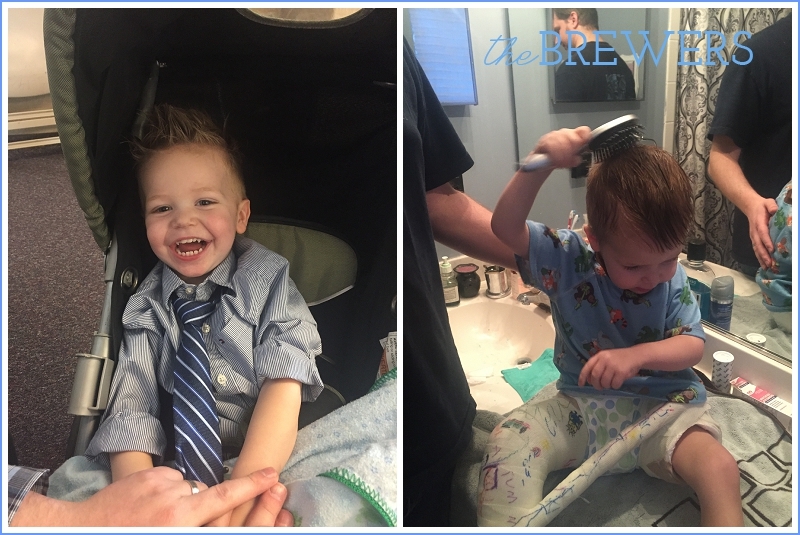 After our first sponge bath, when I asked Brody if he wanted to go take a bath, he ran his little hand through his luscious locks and said, "Hair?" I just love how he has adapted so easily to everything! He's such a smart little boy. Eventually, it was time to take Brody back to church. I couldn't imagine Adam staying home for almost 6 weeks, so once I didn't have a meeting at church in the morning, Brody came with us to church. He sat on our laps or on the pew as best he could with his blankets to help cover and keep his bottom half warm. For classtime, after Sacrament, we brought in the stroller. Mostly because he's too heavy to carry or hold, and I didn't want him on the floor in the Nursery, getting stepped on by adults or children alike. He lasted in the stroller almost the entire time, until he asked my mom to get him out. Adam took him home just before the third hour and after his Sunday School class he teaches. The next week, Brody was tired, and a bit frustrated he couldn't play as usual. 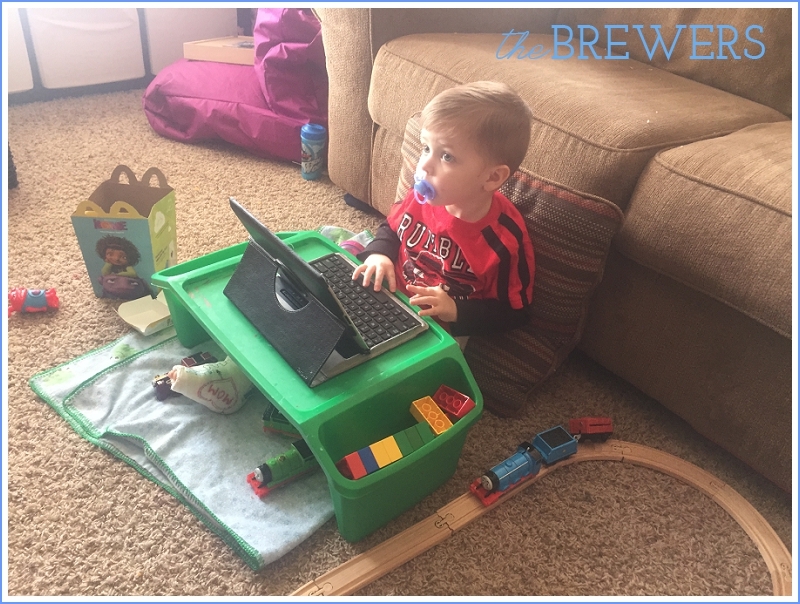 He just wasn't having it, so Adam took Brody with him to his class, where he just played on the iPad and occupied himself while Adam taught. He hasn't had much of an appetite lately, so I consider anything I can get into him a victory. 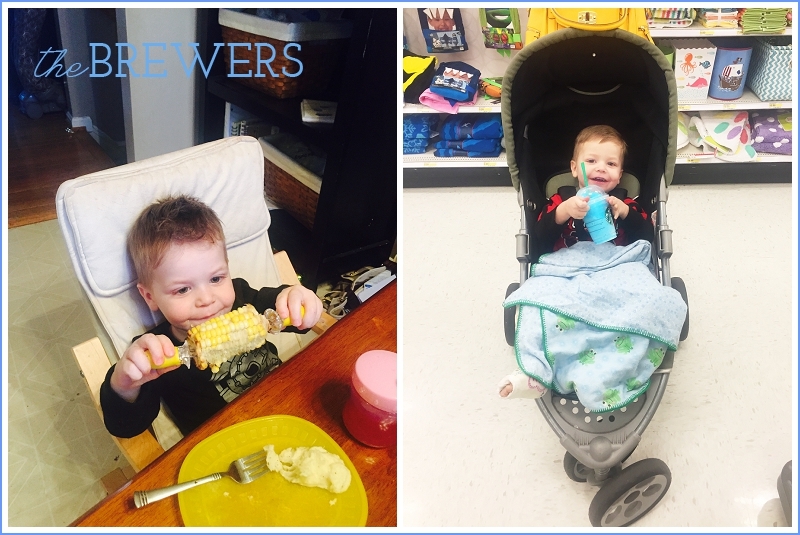 He LOVES corn on the cob and never refuses an Icee at Target! Early on, it was a struggle to find ways for Brody to still play with his favorite toys, but be forced to sit on the floor or couch to do so. He cannot bend forward because of the "belt" of the cast, and the way in which his leg is positioned/the bar makes it difficult and wildly uncomfortable to be on his belly. I tried a few different things, but this child's art table was by far my best idea. For just a few bucks off Amazon, the table slides right over his legs and is perfect for lego. It holds the iPad, and even works as a table when he needs to eat. It keeps things in his reach. Unfortunately it's not large enough for trains or tracks, but as long as Brody was on the floor with a track and could put the automatic trains onto them, he was pretty happy. I sure do miss seeing him on the floor on his belly, eye level with the wheels of his trains, choo chooing! 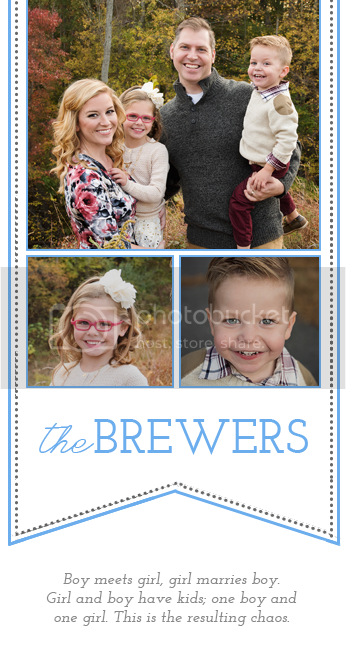 The hardest part was as the weather occasionally warmed up and Autumn was eager to get outside, we had to find the best way to include Brody. He wasn't content to just sit outside in the stroller and bask in the sun, so I would take him out and lay him over my legs to draw or play with whatever we'd brought outside for him. 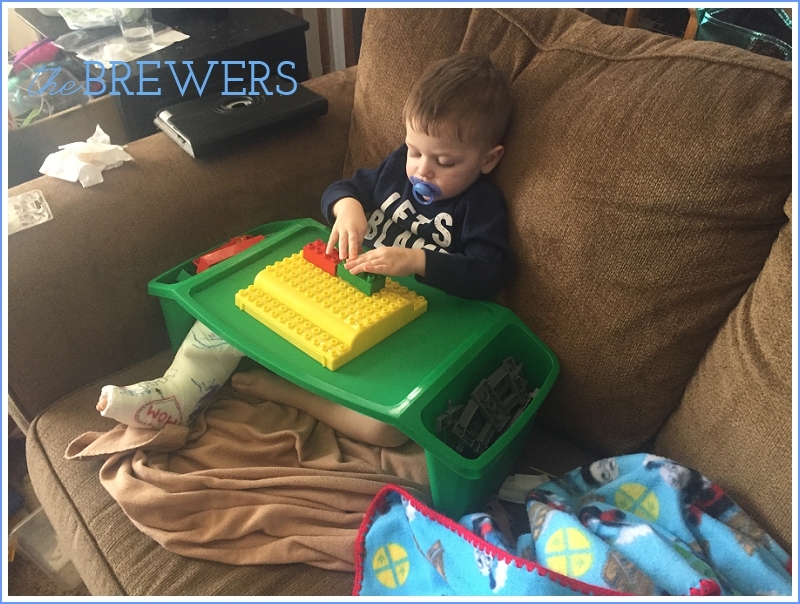 It wasn't ideal, and eventually my legs would start to go numb from the weight, but I am bound and determined to mix up his activity to break up the monotony of sitting on the couch with the TV or the iPad. 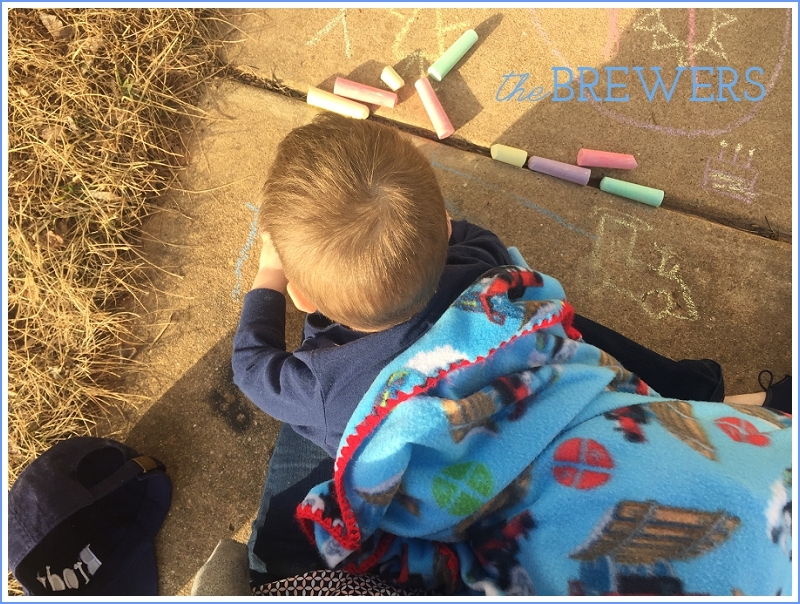 Playing outside on a warm afternoon with the chalk our sweet neighbors gave us in a bag of goodies for Brody when they found out about his accident. Brody has just adapted so much to his new normal. It's been hard to watch more for us than anything else, as he was such an active kid before all of this happened. He's so easy going and it has not been difficult to keep him entertained or find ways to keep him happy. Still, Brody does get frustrated. I can tell that he is growing tired of my clever ways to divert his attention away from something he cannot do. Autumn has also adapted way better than I could have ever imagined. She has never been upset at Brody or with me because of Brody and how he is holding her back. Things could have been so much more trying had this happened in the Spring or Summer. Being confined indoors by both the weather and Brody's condition has been a lifesaver when finding activities for Autumn as well. She has been a great helper to me as well - helping Brody with his games on the iPad when he is frustrated, finding his pluggy (which unfortunately he's become extremely attached to since the accident, understandably), etc. She's never argued or grunted at pitching in and for that I am so grateful. As we head into what we hope will be our last week, we're trying so hard to break up the monotony. To help the frustration I know he's feeling as the weeks have passed. It's hard not to think about what's next for us and what is to come when the cast gets taken off next week. Will he be able to walk? How long will it take for him to be brave enough to put weight on the leg? Will he have a limp? Will he be even more frustrated with the cast off that he still cannot be as mobile as he'd like? I'm trying my best to go into it the last week without any expectations - we'll take it as it comes, just as we have this whole experience. One day at a time.